“It’s not the destination. It’s the journey.” That’s an old travel cliché that might sound nice and all … until you find yourself twiddling your thumbs at an airport for hours on end, traumatized after a long check-in line, and a long security line, and a long customs line, and…. A lot of people who love traveling hate airports. If you’re one of those people, airport guru Harriet Baskas will come to your rescue on the latest episode of the Globejotting Travel Show on Expat Radio. 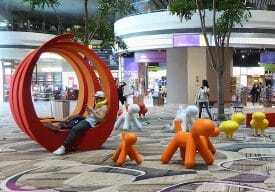 She shares tips on how to make your time at the airport a fun adventure instead of a headache. Harriet is a USA Today travel columnist who specializes in airport. She also runs the Stuck at the Airport blog. She says there’s fun to be had at any airport … if you know how to look for it. Harriet is an expert at sleuthing out fun things to do at airports, in fact, she loves airports so much, whenever she travels, she allows extra time to explore them – and she has uncovered some real gems! 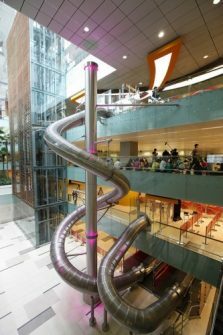 Singapore’s Changi Airport has a giant, four-story slide. Kastrup Airport in Copenhagen has chairs that are specially designed to accommodate older people’s butts. And in Fort Wayne, Indiana, travelers are greeted with freshly baked cookies when they disembark from their airplanes. Later in the program, travel humorist Kirsten Koza is back. This time, she’s uncovered some bizarre dirt on airline behavior of the past. From 1953 to 1970, United Airlines offered special men-only flights that featured steak, whiskey, and cigars. Kirsten also reveals some shocking information on a way some female flight attendants used to deal with gropey male passengers. On a more serious note, she says sexual harassment in the airline industry is still alive and well today. She talks about a pending complaint that Air Canada flight attendants have lodged against the airline. We wrap up the show with a celebration of sorts! This coming week is the ten-year anniversary of my first trip to Vietnam … which was intended to be a one-time, one-week vacation. Instead, I ended up moving here. I tell a story about how the simple act of crossing the road on my first night in Saigon changed my life. Listen to this month’s episode here. For updates on the latest programs, subscribe to the Globejotting newsletter. The Globejotting Travel Show streams on the first Tuesday of each month on Expat Radio, with a repeat on the third Tuesday. All episodes are also available on Globejotting.com and will soon be available on iTunes and YouTube as well.